Why Should You Consider Vitulus? Vitulus’ market research has revealed a number of reasons why their customers consider our cattle when planning a ‘Tree-Change’. For many it has always been their dream to own small acreage and run some cattle. Ausline and Lowline fit these requirements perfectly whether is be just as a hobby to keep the grass down or to develop a show quality herd to supply superior seed stock to the beef industry. They are a smaller, docile breeds that are easy on the land and fit easily within those principles of sustainable agriculture. Some other interesting statistics about their clients reveal dual income households, a high percentage of women who will be involved with the livestock and management of the farm, limited prior knowledge so small quiet animals are preferable as well as the ability to earn a return from their investment. As the imperative to increase farm profitability continues, reduction costs must be minimised while the returns to the producer maximised. Early maturing cattle offer a number of significant and obvious advantages such as higher stocking rates, ability to maximise available feed, shorter production time, lower production costs and higher valued products. 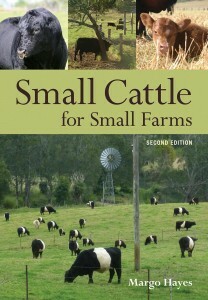 There are more small farms in Australia than there are big farms; the Australian market for beef is the prime cuts not hamburger mince; the Australian appetite is for a thick juicy portion of steak not something that is 20mm thick and hangs off the side of the plate; and more importantly for the farmer being able to produce finished cattle sooner means more cattle per hectare. For alert and proficient Australian primary producers world population growth will underwrite rural returns from well managed enterprises into the foreseeable future. It is also vital to ensure that long-term environmental sustainability does not cost the producer their short-term financial viability. Beef producers have to adopt a greater understanding of sustainable agriculture and its concepts. We need to ensure that our natural resources are left in pristine condition for future generations and this will also assist Australia in maintaining its competitive edge but utilising its ‘clean and green’ image. Lowline cattle are gentle on our environment and allow for harmony with the land. Feed efficient animals that produce quality carcasses with more meat and less bone. Ausline with their commercial register have the ability to satisfy this “market of the future”. early Maturity patterns allow for faster finishing progeny.